I have known author Judi Neal for over 15 years. My original connection with Judi was through an organization she founded called “Spirit@Work”. She is certainly a thought leader and pioneer in the arena of organizational and personal transformation. When I learned about her new book entitled ” Handbook for Personal and Organizational Transformation” I knew it would be an opportunity to take a deep dive into a subject that most leaders in business need to learn more about. While this 600 page textbook entitled “Handbook for Personal and Organizational Transformation is not going to attract the average person to rush out and purchase this textbook, the compilation of research and this opus is well worth the investment if you are attempting to transform your organization’s culture. In my recent interview with Judi we discuss the the fact that organizational transformation is impossible without personal transformation. “Einstein said that we cannot solve problems from the same mindset that created the problems. In order to see positive change occur in the world, we must shift our consciousness to a high level of thinking and being, but we must also have systems or approaches that scale up, so that there is a collective shift in consciousness in groups, work teams, villages, governments, and corporations”. If you want to learn more about Judi and her work please click here to be directed to her website at Edgewalkers. 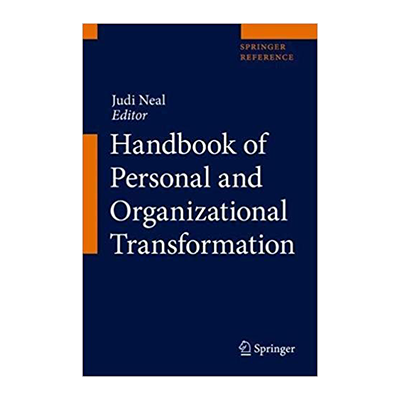 Judi is also the author of a great book entitled “Creating Enlightened Organizations.” This book is a much more condensed read, and would be a good place to start if you are looking to learn more about organizational transformation.